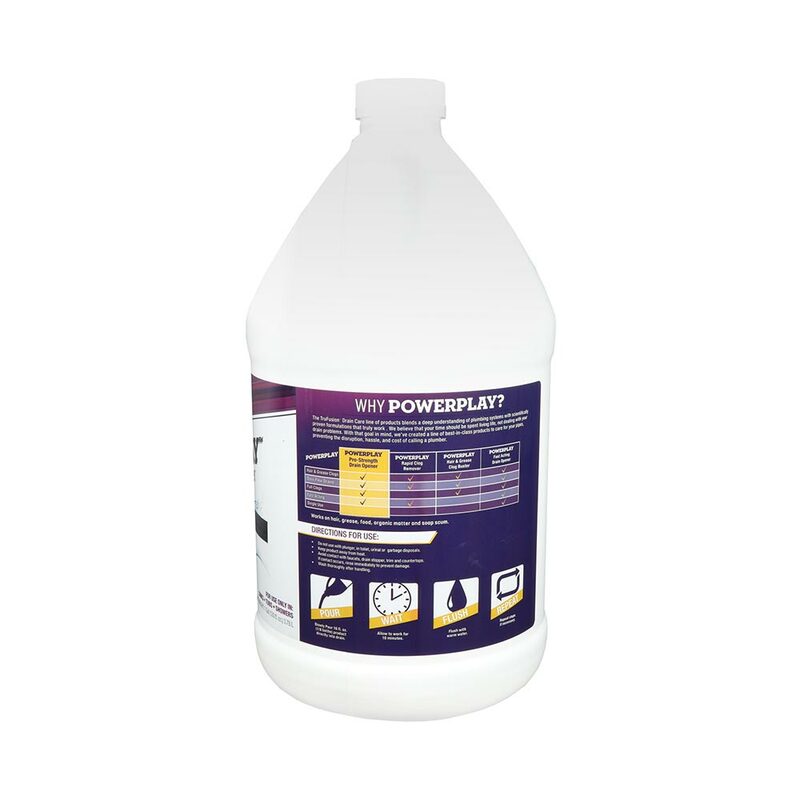 2X STRONGER FORMULA - Breaks through tough clogs with 2X the concentrate than leading bleach products. FAST ACTING - See results in as little as 10 minutes* of treating your drain. 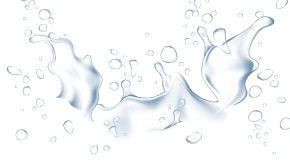 DISSOLVES THE TOUGHEST CLOGS - Uniquely formulated to cut through common clogs due to grease, hair, food, organic matter and soap scum. PROFESSIONAL STRENGTH - This pro-grade strength drain opener was developed for residential or industrial use. 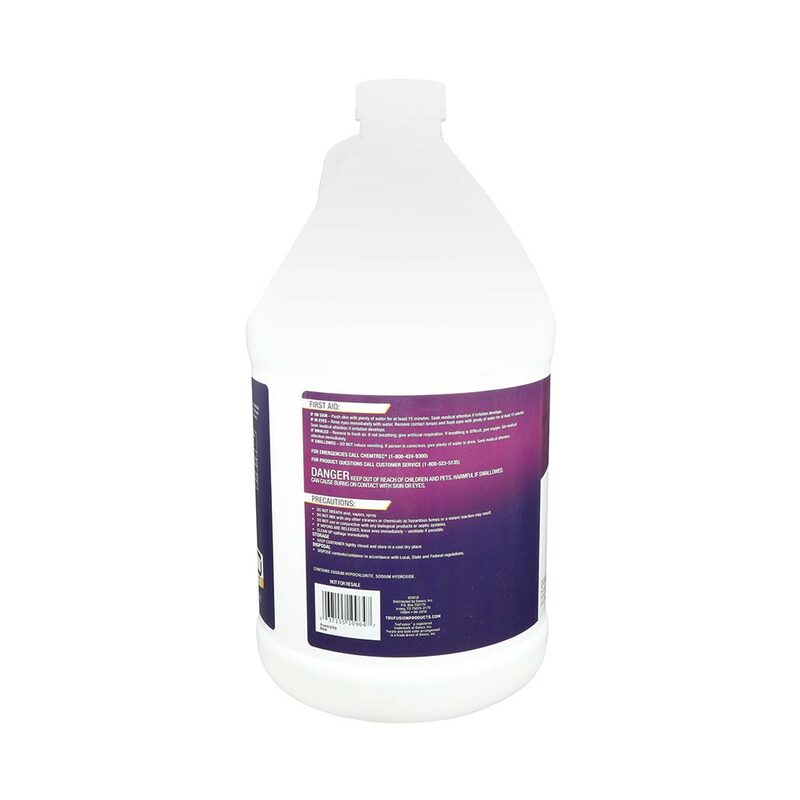 MULTI-USE - The 1 gallon bottle contains 8 treatments, perfect for proper drain care maintenance. Slow Running Drain?Clogged Drain?Slow Running Toilet?Clogged Toilet?Septic Issues? The TruFusion™ POWERPLAY™ Pro-Strength Drain Opener quickly opens tough clogs from hair, grease, food, organic matter and soap scum. The unique formula contains 2X the concentrate than leading bleach products, making it the perfect solution to fight against hair and grease clogs, slow-flowing drains and full clogs. Simply pour 16 fl. oz. (1/8 bottle) product directly into drain, allow to work for 10 minutes then flush with warm water. Repeat steps if necessary. This product is safe for use in sinks, tubs and showers. Do not use with plunger, in toilet, urinal or garbage disposals. Pour – Slowly pour 16 fl. oz. (1/8 bottle) product directly into sink, tub or shower drain. Wait – Allow to work for 10 minutes. Flush – Flush with warm water. Repeat – Repeat steps if necessary. Slowly pour 16 oz. (1/8 bottle) into sink, tub or shower drain. Allow product to work for 10 minutes then flush with hot water. For severely clogged drains, repeat steps if necessary. Do not use with plunger, in toilet, urinal, or garbage disposals. Keep product away from heat. Avoid contact with faucets, drain stopper, trim and countertops. Wash thoroughly after handling. If contact occurs, rinse immediately to prevent damage. Thank you! Your review has been received and will be posted soon. You can buy all purpose Trufusion Drain Cleaners from amazon. IF ON SKIN – Flush skin with plenty of water for at least 15 minutes. Seek medical attention if irritation develops. IF IN EYES – Rinse eyes immediately with water. Remove contact lenses and flush eyes with plenty of water for at least 15 minutes. Seek medical attention if irritation develops. IF INHALED – Remove to fresh air. If not breathing, give artificial respiration. If breathing is difficult, give oxygen. Get medical attention immediately. IF SWALLOWED – DO NOT induce vomiting. If person is conscious, give plenty of water to drink. Seek medical attention. DANGER Keep out of reach of children and pets. Can cause burns on contact with skin and eyes. Read entire label prior to use. Keep out of reach of children and pets. Harmful if swallowed. Can cause burns on contact with skin or eyes. Contains Sodium Hypochlorite, sodium hydroxide. DO NOT BREATH mist, vapors, or spray. DO NOT MIX with any other cleaners or chemicals as hazardous fumes or a violent reaction may result. DO NOT use in conjunction with any biological products or septic systems. IF VAPORS ARE RELEASED, leave area immediately – ventilate if possible. STORAGE – Keep container tightly closed and store in a cool dry place. The TruFusion™ POWERPLAY™ Rapid Clog Remover’s fast-acting formula releases clogs from hair, grease, food and organic matter in minutes. Its fast-acting formula contains 2X the concentrate than leading bleach products to bust through the toughest hair and grease clogs and frees slow-flowing drains. 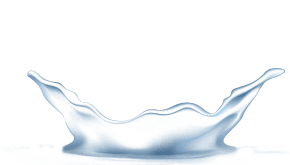 The TruFusion™ POWERPLAY™ Hair & Grease Clog Buster dissolves full clogs from hair and grease. The 2X concentrated formula gives this product max-strength against hair and grease clogs, frees slow-flowing drains and busts through full clogs. The TruFusion™ WASHOUT™ Build-Up Remover eats away hair, grease, paper, organic matter, food and soap scum with specially formulated dual-action biologicals and enzymes. 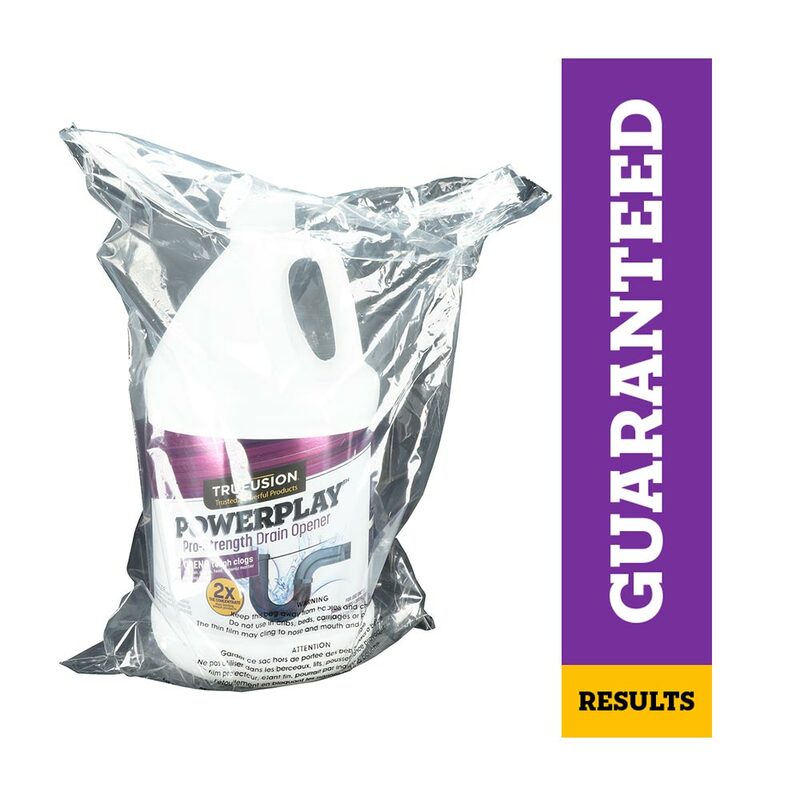 The unique WASHOUT™ Build-Up Remover formula helps dissolve years of build up inside pipes while breaking through common buildup that causes slow-running drains and slow-draining toilets. 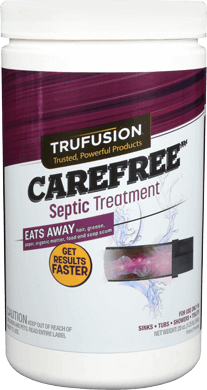 The TruFusion™ CAREFREE™ Septic Treatment eats away hair, grease, paper, organic matter, food and soap scum achieving results faster with our dual-action natural bacteria and enzymes formula. 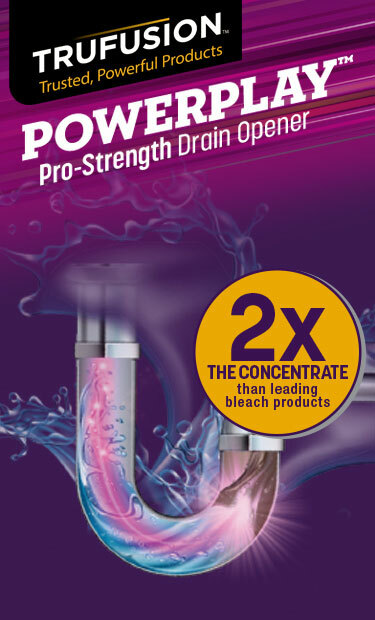 The TruFusion™ POWERPLAY™ Fast Acting Drain Opener dissolves tough clogs in minutes*. It’s designed to eat away hair and grease clogs while removing full clogs and slow flow drains – all in one fast-acting single dose. Care and maintain your toilet with the TruFusion™ FLUSHWORTHY™ Toilet Care Powder. The FLUSHWORTHY™ Toilet Care Powder instant action technology and impactful combination of biologicals & enzymes helps prevent backups from paper and organic waste while sustaining a healthy septic system. Use regularly for monthly maintenance to prevent slow drains, buildup on drain pipe walls, and decrease the frequency of slow-flowing standard toilets.